My forms require people to enter a name - is it possible to develop a feature where form submissions must be unique according to this name rather than according to IP address? I'm concerned that two people sharing the same internet connection would have problems trying to submit forms. Another form builder has the feature, but I prefer Jotform's service plans to other form builders, but must soon make a decision as to which service to pay for. JotForm has a feature to check uniquness by cookie and IP address. If you check by cookie then people who use the same IP address can still make submissions. 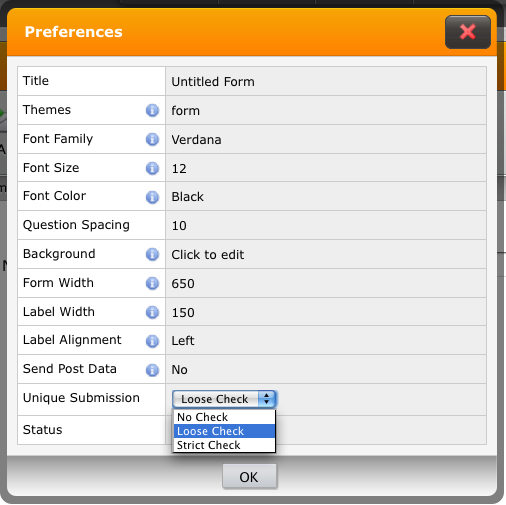 You can enable the cookie check by selecting "Loose Check" on Preferences. I also added your request about the uniqueness validation to our suggestions list. Unique submissions by field rather then IP/cookie is also the solution for my problem. I am looking for an easy tool to create forms, which can be used for internal questionnaires en subscriptions for events. People have to be able to make changes to there subscription after it is submitted. The mail with update link is only part of the solution, because the user can still create a new subscription. The IP-adres is not a good reference for uniqueness, because people can log in from different locations. Is there a way we can make sure that someone does not subscribe more than once for the same event ? Unfortunately no, it is not possible have unique fields for all submissions. I added this to our feature requests list.